Surprisingly, the Shroud images encoded with information that can be plotted as 3D projections. They are terrain maps. 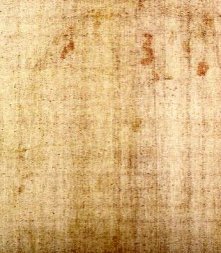 What is encoded onto the Shroud is a terrain map of a man’s head and body. Both the front side and the backside images are this. And we don't know why this is so. With space-age image analysis equipment or off-the-shelf graphics software running on a home computer we can plot this encoded information and produce a realistic isometric plot, an angular view of a three-dimensional shape. 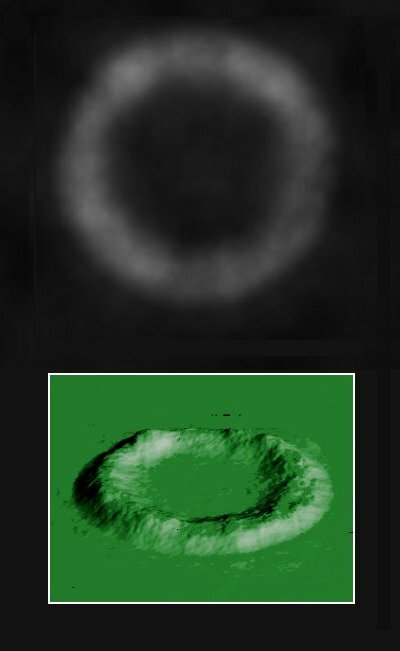 The hazy donut shape shown below is an example of a terrain map for the crater rendered as a three-dimensional shape. In the picture above you can see the peaks on the rim of the crater as brighter areas on the hazt donut. In the case of the Shroud we do not get a perfect three-dimensional rendering for many reasons: If, as scientists suspect, what is encoded on the Shroud, as data, is the distance between any point on the man’s body and the cloth loosely draped about him, then the distance will be distorted by the drape of the cloth. We can assume it is not perfectly flat. Physicists have estimated that the maximum distance represented is about 3 or 4 centimeters, but we don’t know how linear the scale might be in the image formation process. We might know that if we knew how the images were created, but we don’t. The image is very old and we don’t know how fading or maturing of the images and the aging of the cloth might have altered the accuracy of the distance that is encoded. Finally there are bloodstains and dirt that cause distortions. That there is a distance encoded representation at all is amazing. 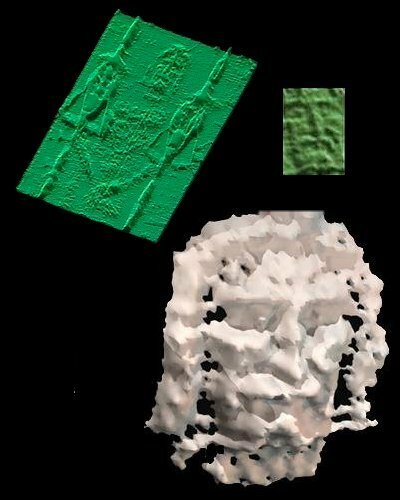 It is important to point out that no identified works of art, no known artifacts or relics of any kind will produce a 3D plot like the one produced by the Shroud. Researchers have tried every imaginable artistic method including bas-relief rubbings, scorching with hot statues, daubing the surface with pigment dust, and image transfer rubbings. Nothing does or can be expected to produce a 3D plot.